With their arsenal of exotic guitars, Kastning and Szabó masterfully create a mysterious world of sweeping textures, emotional shadows, colorful points of light and shimmering angular melodic fragments. Much like a winter landscape as light meets night, there is an abundance of beauty and magic available in every direction to thoroughly capture the listener’s imagination, pushing the boundaries of what can be crystallized into melodic structure. There are a variety of elements at work here, with Kastning’s 30 and 36 string acoustic guitars providing the foundation for most of the melodic elucidations, with some occasional piano doing the same, using a variety of techniques, including a strong contribution from the studio itself, providing a very natural and crisp sounding reverb. Szabó, with electric guitar and baritone electric and a veritable mountain of effects and processing devices provides the strong textural backdrop that follows Kastning’s instrumental wanderings, opening a vast open panorama for the proceedings. 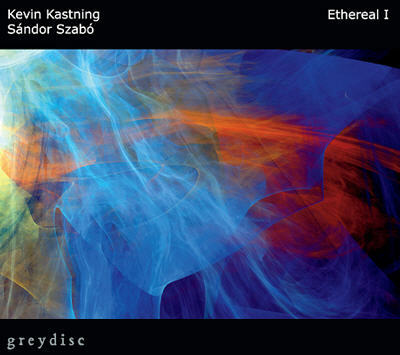 From the title, one might conclude that the collection of ten tracks herein is the first in a new series of more to come, and although Kastning and Szabó have collaborated on at least nine previous releases, Ethereal I is a distinctly different endeavor than any of its predecessors. This is the place where a listener’s mind can be set free in a dreamy world of bright and muted colors, textures, and pure sonic enlightenment.